Stay with me here, this one's gonna take a while. 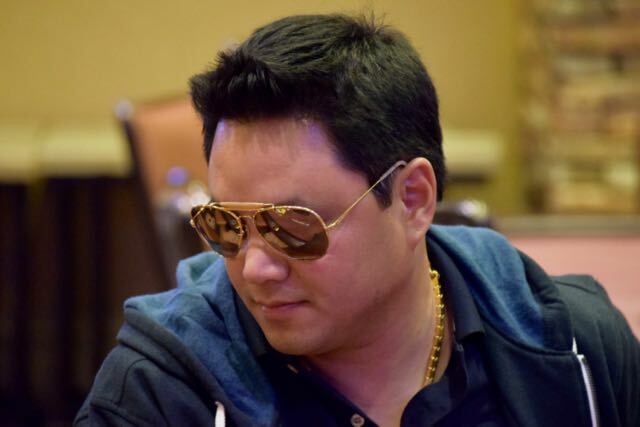 Anton Dimagiba (above) and Khan Saechao are both all in preflop, called by Dylan Lasr and Roger Bailey. OK, we got that much. The flop is 6-5-7, Lasr bets out and Bailey calls. Both players check the 4 turn. Yep, 3-4-5-6-7 straight on the board. Lasr shows TT, overpair on the flop. Dimagiba shows KK, a bigger overpair. He flopped middle set with 55, had all the players covered and the river corrupts his set, or Bailey knocks out three and moves to a massive chiplead. Chop it up, nothing to see here, folks.